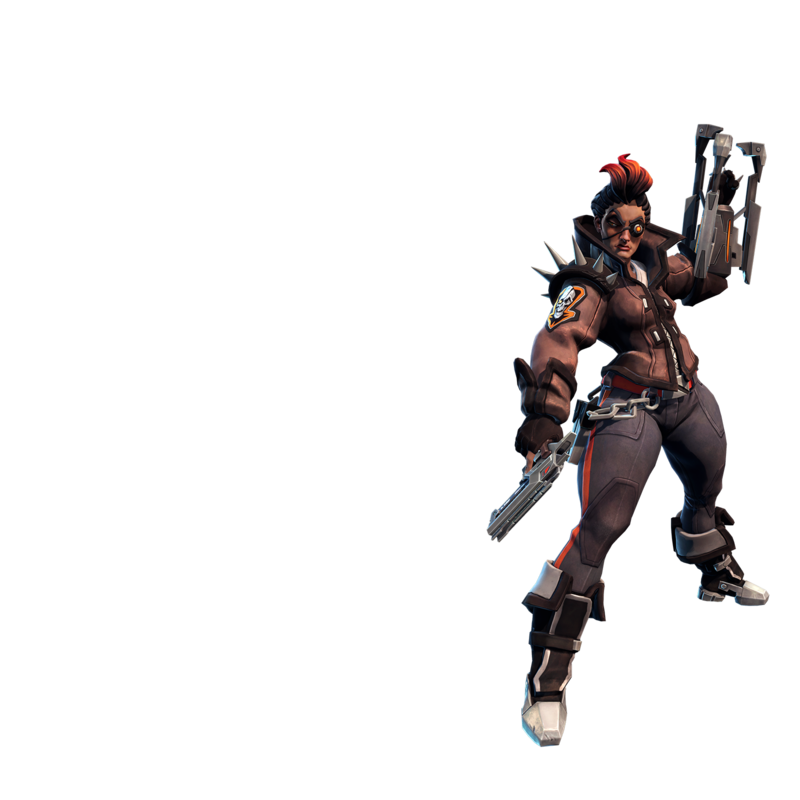 Known as "the Valkyrie", Reyna Valeria is one of the few Battleborn native to the Solus system, and the ad-hoc leader of the Rogues. Reyna uses her command glove to shield her allies from danger and mark targets for swift retribution. 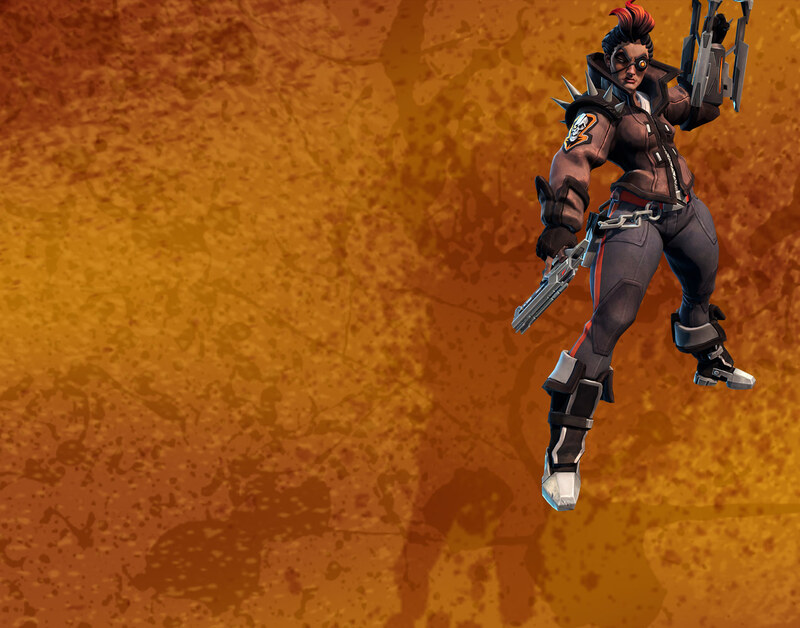 Reyna's primary attack utilizes her lethal laser pistol to deal damage to her enemies. Reyna's secondary attack launches shield-melting plasma pulses from her command gauntlet, dealing 50% bonus damage to shields. Applies an overshield to target ally that blocks a limited mount of damage over the next few seconds. During the time, Reyna's Plasma Pulse can charge the target's shield. Fire a homing blast that deals damage (with a bonus to shields) and reveals the target's position. The target takes increased incoming damage for a limited time. Deploy a large energy dome that immediately knocks enemies out of the area, and continues to block enemy fire from entering or exiting for a limited time. When Reyna places a Shield Booster overshield on an ally, she receives one as well. While under the effects of Shield Booster, allies receive a constant, passive shield recharge bonus. Plasma Pulse shots home in on enemies marked with Priority Target. Plasma Pulse fire explodes on impact, dealing damage to nearby enemies. When a Shield Booster overshield is applied, it instantly restores a portion of the wearer's health. While Failsafe is active, all of Reyna’s active cooldowns are reduced. Increases the amount of damage absorbed by a Shield Booster overshield before it breaks. When Plasma Pulse damages an enemy’s shield, a portion of that damage is restored to Reyna’s shield. Does not function while Reyna’s shield is down. Increases the duration of Priority Target’s debuff effects. Increases Shield Booster overshield duration. Disables the shields of all enemies within Photonic Ward’s area of effect. Increases the speed and range of Priority Target's homing blast. If Priority Target fails to mark a target, half the cooldown is refunded. Reyna's Laser Pistol and Plasma Pulse briefly slow enemies marked with Priority Target. When a Shield Booster overshield is applied, it explodes, damaging nearby enemies. Prevents Reyna’s Plasma Pulse from overheating while Failsafe is active. Increases initial impact damage of Priority Target. Increases Plasma Pulse base damage. Increases extra damage suffered by enemies marked by Priority Target. A portion of the damage absorbed by a Shield Booster overshield is reflected back at the attacker. Increases the duration of Photonic Ward and causes the shield to follow Reyna as she moves.